UPDATE: A former executive director of the Fraser Institute has confirmed to the Vancouver Observer that the think tank has been taking money from the Koch brothers for "years and years." “I know the grant from the Koch Foundation is for our international work, but I can't tell you which of the projects ... it's funding,” Fraser Institute co-founder Michael Walker said. “Before the Koch Foundation, we used to get funding from Koch Industries, when they had extensive holdings in Canada." Canada’s governing Conservatives have launched a campaign to go after charitable groups that engage in politics, in a fairly transparent effort to fight back opposition to the expansion of Canada’s oil industry. The Tories and their allies have made a meme out of complaining that Canada’s environmental groups are backed by foreign money, conveniently omitting that Canada’s oil sands have themselves been built with billions in foreign money. But if the Tories go ahead with their campaign against politically active charities, they may find themselves having to smack down some of their own preferred charitable organizations -- those that back the oil sands. In a report released earlier this month, the left-leaning U.S. Center for American Progress reported that the Koch brothers, owners of Koch Industries and a favourite target of the American left, had donated $373,721 in total to the Fraser Institute, arguably Canada’s most prominent right-wing think tank and an official charity registered with the Canada Revenue Agency. The Vancouver Observer reported Wednesday that that number may be somewhat higher. According to their research, the Koch brothers had donated nearly $500,000 to the Fraser Institute between 2008 and 2010. That may have to change with the Tories' new insistence on funding transparency from charitable groups. News of the Koch brothers’ involvement with the Fraser Institute -- which has come out strongly in favour of expanding oil sands infrastructure -- will likely provide ammunition to the oil sands’ opponents as proof foreign involvement in Canada’s environmental policy is a two-way street. 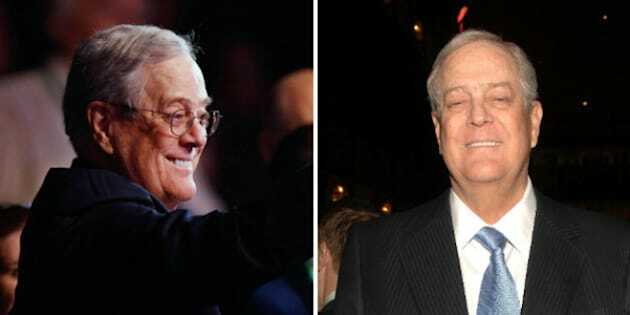 The Koch brothers have become bogeymen in recent years to the American left. The group they founded, Americans for Prosperity, has been described as one of the most influential groups in the rise of the U.S.’s tea party movement of the past four years. The brothers have become notorious for their use of tea-party language. Charles Koch has compared Obama to Saddam Hussein; the brothers recently launched an attack ad against Obama, blaming the president for high gas prices. They also joined an effort to raise $100 million towards Obama’s defeat. Though it’s hard to determine all the different ways that the Koch brothers’ activism has touched Canadian politics, the billionaire brothers have been linked to other issues of concern to Canadians. Their group, Americans for Propsperity, recently bankrolled an effort to stop the construction of a new Windsor-Detroit bridge that Ottawa desperately wants to see built. The anti-bridge campaign was accused of misleading Detroit residents about the bridge’s impact. The government said it would be cracking down on charitable groups that exceed their legal limit on political spending -- 10 per cent of the charity’s budget. CLARIFICATION: An earlier version of this story referred to the Fraser Institute as being "Tory-allied." While there is some overlap in the membership of the Conservative Party of Canada and the Fraser Institute, the groups are not formally affiliated.